Matcha is the latest craze to hit mainstream media. You see it as matcha tea lattes, matcha protein powder, matcha boba or bubble tea and even as matcha infused cocktails. So what’s the hype and is it really as beneficial as they say it is? When you brew a cup of green tea, only a fraction of its antioxidants and minerals are consumed because the majority remains in the tea leaves itself. The only way to truly take advantage of green tea’s full potential is to consume the entire leaf - Enter Matcha. Matcha is the finely stone-grounded powder version of your classic green tea. It is an arsenal of amino acids, vitamins, minerals, and antioxidants. In fact, to match the potency of a single serving of matcha, you would need to polish off ten cups of brewed green tea. The experts at Tufts University used a testing method known as ORAC (oxygen radical absorbance capacity) and revealed that matcha possesses twenty times more antioxidants than blueberries or pomegranates. What are antioxidants anyway? Antioxidants are found in your body and foods and help defend your cells from damage caused by potentially harmful molecules known as free radicals. In addition to having the highest ORAC rating, matcha is equipped with a potent class of antioxidant known as catechins. Specifically, the catechin EGCg (epigallocatechin gallate) has been shown to have cancer-fighting properties in recently published articles. EGCg and other catechins help counteract the effects of free radicals from the likes of UV rays, radiation, pollution, and chemicals. 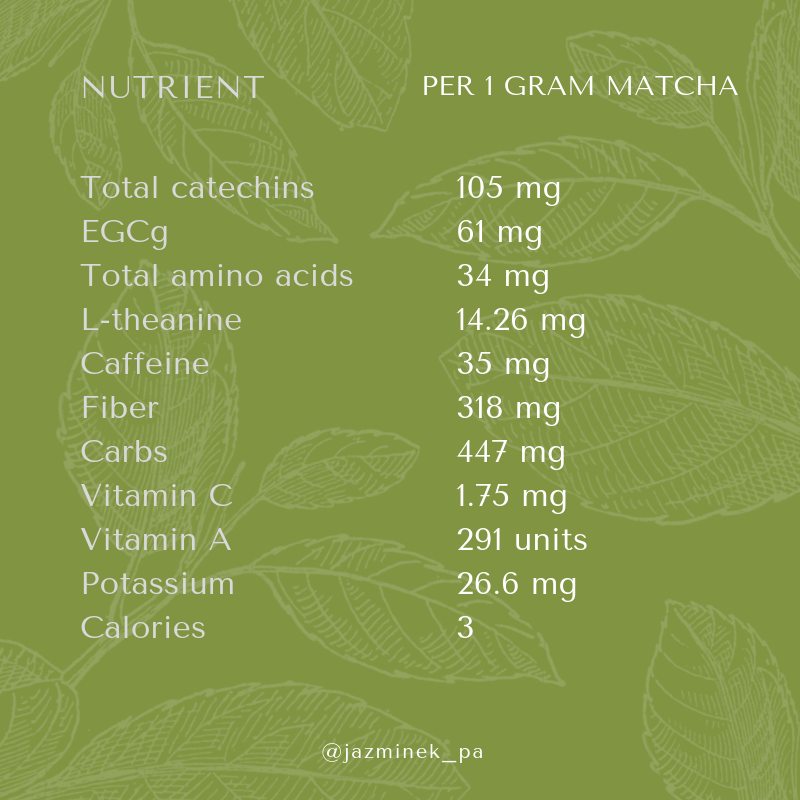 Since over 60% of the catechins in matcha is actually EGCg, a daily matcha regimen can help restore and preserve the body’s integral well-being and balance. After travels in China during the 12th century, Japanese Buddhist monk Eisai brought home green tea and the knowledge of how to grind its leaves into a powder to create matcha. Eisai, a Zen practitioner, drank matcha for both medicinal and meditative benefits. During the elaborate and choreographic Japanese tea ceremony, matcha is mixed with hot water using a bamboo whisk. Positive values are applied to the whole process of the ceremony and highlight qualities like beauty, simplicity, discipline, kindness, and respect. With an earthy, vegetal taste, matcha's flavor intensity and quality vary based on how it is produced. From inexpensive blends of low-grade matcha powder with added sugar and milk solids to pricey organic high-grade matcha in online specialty shops, quality determines cost and availability. Matcha tea comes in different grades. What you pay for is flavor profile, not nutrients. Young leaves plucked early in the harvest, produce delicate and vegetal flavors. Mature leaves contain more coarse matter from stems and veins and taste more astringent. Ceremony Grade has the highest concentration of amino acids, adding to the complexity of the taste and aroma of the tea. Bright grassy notes softened by copious quantities of creamy amino acids. Classic grade matcha, made from early harvest leaves. The taste is vegetal with a distinct bitter note at the end. Excellent for tea whisked in a bowl. Perfect for adding to blended drinks or for use in recipes try it in smoothies, lattes, savory sauces, and desserts. Pale in hue and astringent on the palate, use this bulk economical option for blending in power drinks, smoothies, and desserts with sugar and cream. Sift 1-2 teaspoons of matcha into a cup or bowl. Add 2 ounces of hot water (not boiling) to matcha. Whisk vigorously with a bamboo whisk or any type of mixer. Whisking in a “W” pattern, rather than in circles, will make your matcha foamier. If you prefer thicker matcha — known as koichu — double up the amount of powder you use. Dilute with more water if needed and enjoy! 5. Add your choice of milk to a glass of ice. 6. Pour your prepared matcha over milk and ice and voila! Everything in moderation ~ Though matcha is a nutritional powerhouse, pregnant and nursing women should skip it altogether. Consuming too much of this potent antioxidant has been linked to decreased iron absorption and liver damage if taken with acetaminophen. Don’t get lost in the hype ~ more matcha does not necessarily mean better. One to two teaspoon serving of matcha, no more than once daily is certainly a valuable addition to any diet. Like with any other trendy health food, you can get your dose by eating or drinking it, though drinking it as a tea, how it was initially intended, provides all the benefits without the added calories. Keep calm and Matcha on!